(1) Local anesthetic syringe and needle – to provide adequate anesthesia to reduce amount of pain you will experience during treatment. (2)Rubber dam – is used to isolate tooth of interest and allow visualization , retract tissues and prevent small instruments from dropping into patient’s throat. Rubber dam can also serves as a barrier against the patient’s saliva to allow a bacteria free operating field. (3) Rubber dam clamp – available in different sizes to hold rubber dam in place. 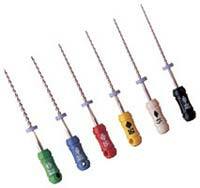 (4) High speed handpiece and endodontic burs – to create an access opening to locate the root canal orifices. (5)Suction tip – to aspirate water generated from the hand piece thus provides a better visualization for the dental surgeon. Instruments which are used during cleaning and shaping . Can be hand operated or engine driven. (1) Broaches – are made from stainless steel , used to remove root canal contents. (2) Files – are usually made of stainless steel or nickel titanium files. Available in different sizes and can be identified through different colour coding. Files are used to smooth and plane root canal walls so that a taper shape is formed to facilitate good obturation of the root canals. Nickel titanium files are flexible compared to s and used to clean and shape curved canals. Files are characterized differently based on their cross-section and have different clinical use. (4)Plugger, plastic instrument. (flat surface instrument) – to place temporary restoration to seal the cavity in between appointments. 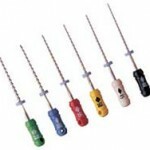 (5)Lentulo spiral drill – some dentists use lentulo spiral drill to place intra canal medicaments. Obturation is done to seal the root canal system after adequate cleaning and shaping is done. (1)Spreader – to ease placement of gutta percha during obturation , adapt gutta percha and provide space for accessory gutta percha to go in. (2)Plugger – is used to condense gutta percha and conform gutta percha into root canal spaces. After root canal treatment is completed, a permanent restoration will be placed on the cavity created earlier to restore the lost tooth structure. Further treatment such as crown or bleaching can be done after root canal treatment based on how much tooth structure is lost or how severe the tooth is discoloured.